Herschel has produced an intricate view of the remains of a star that died in a stellar explosion a millennium ago. It has provided further proof that the interstellar dust which lies throughout our Galaxy is created when massive stars reach the end of their lives. Astronomers have discovered vast comet belts surrounding two nearby planetary systems known to host only Earth-to-Neptune-mass worlds. New stars can be seen bubbling up around the remains of a dramatic stellar explosion in this new portrait from two space telescopes. Galaxies in the early universe grew fast by rapidly making new stars. Such prodigious star formation episodes, characterized by the intense radiation of the newborn stars, were often accompanied by fireworks in the form of energy bursts caused by the massive central black hole accretion in these galaxies. This discovery by a group of astronomers led by Peter Barthel of the Kapteyn Institute of the University of Groningen in the Netherlands is published today in the Astrophysical Journal Letters. A beautiful blue butterfly flutters towards a nest of warm dust and gas, above an intricate network of cool filaments in this image of the Vela C region by ESA’s Herschel space observatory. The Herschel Space Observatory has discovered a giant, galaxy-packed filament ablaze with billions of new stars. The filament connects two clusters of galaxies that, along with a third cluster, will smash together and give rise to one of the largest galaxy superclusters in the universe. The Herschel Space Observatory has shown galaxies with the most powerful, active black holes at their cores produce fewer stars than galaxies with less active black holes. The results are the first to demonstrate black holes suppressed galactic star formation when the universe was less than half its current age. New data from the Herschel Space Observatory suggest comets are constantly smashing together around the star Fomalhaut. The cataclysmic history of a giant galaxy is on display in a new image that combines infrared and X-ray observations. A study of galaxies in the deepest far-infrared image of the sky, obtained by the Herschel Space Observatory, highlights the two contrasting ways that stars formed in galaxies up to 12 billion years ago. Dr Georgios Magdis will present the results at the National Astronomy Meeting in Manchester. Astronomers have spotted young stars in the Orion nebula changing right before their eyes, thanks to the European Space Agency's Herschel Space Observatory and NASA's Spitzer Space Telescope. In 1995, NASA's Hubble Space Telescope took an iconic image of the Eagle nebula, dubbed the "Pillars of Creation," highlighting its finger-like pillars where new stars are thought to be forming. Now, the Herschel Space Observatory has a new, expansive view of the region captured in longer-wavelength infrared light. The cold dust that builds blazing stars is revealed in new images that combine observations from the Herschel Space Observatory and Spitzer Space Telescope. The new images map the dust in the galaxies known as the Large and Small Magellanic Clouds, two of the closest neighbors to our own Milky Way galaxy. Using data from the Herschel Space Observatory, astronomers have detected for the first time cold water vapor enveloping a dusty disk around a young star. The findings suggest that this disk, which is poised to develop into a solar system, contains great quantities of water, suggesting that water-covered planets like Earth may be common in the universe. Astronomers have found a new cosmic source for the same kind of water that appeared on Earth billions of years ago and created the oceans. The findings may help explain how Earth's surface ended up covered in water. Chalk up one more feat for Saturn's intriguing moon Enceladus. The small, dynamic moon spews out dramatic plumes of water vapor and ice. New findings from the Herschel Space Observatory paint a more tranquil picture of galaxy growth than previously thought. The Herschel Space Observatory's large telescope and state-of-the-art infrared detectors have provided the first confirmed finding of oxygen molecules in space. The molecules were discovered in the Orion star-forming complex. New observations from the Herschel Space Observatory show a bizarre, twisted ring of dense gas at the center of our Milky Way galaxy. Only a few portions of the ring, which stretches across more than 600 light-years, were known before. New observations from the infrared Herschel Space Observatory reveal that an exploding star expelled the equivalent of between 160,000 and 230,000 Earth masses of fresh dust. This enormous quantity suggests that exploding stars, called supernovae, are the answer to the long-standing puzzle of what supplied our early universe with dust. Observations with Herschel-HIFI of water in a young Sun-like star reveal high-velocity bullets moving at more than 200,000 kmh from the star. This can be compared to the velocity of a bullet from an AK47 rifle, which is 2500 kmh or 80 times slower. Herschel observes in the far-infrared, which allows it to see cold gas and dust between the stars. But many of the greatest discoveries in astronomy have been achieved by combining observations from telescopes observing at different wavelengths. 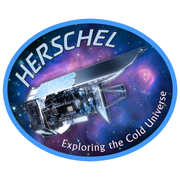 The Herschel Space Observatory has been observing the sky at infrared wavelengths since shortly after its launch two years ago, on 14th May 2009. But the name Herschel has a much longer legacy than that. Herschel Space Observatory has detected raging winds of molecular gas streaming away from galaxies. Herschel Space Observatory has detected massive amounts of molecular gas gusting at high velocities - in some cases in excess of 1000 kilometers per second - from the centers of a sample of merging galaxies. Astronomer Joel Green of The University of Texas at Austin has been following a rare massive flare from a nascent star similar to the early Sun using the European Space Agency's infrared Herschel Space Observatory and a cadre of other telescopes. Do Cosmic Strings of Gas Come From Sonic Booms? The Herschel Space Observatory has found evidence that tangled filaments in space may be shaped by sonic booms. The Herschel Space Observatory has revealed how much dark matter it takes to form a new galaxy bursting with stars. The Royal Astronomical Society (RAS), the UK’s voice for professional astronomers and geophysicists today announced the recipients of the Society’s medals and awards for 2011. The prizes honour individuals who have made an outstanding contribution to astronomy and geophysics and will be given out at the 2011 National Astronomy Meeting to be held in Llandudno, Wales, in April. This mosaic of the Andromeda spiral galaxy highlights explosive stars in its interior, and cooler, dusty stars forming in its many rings. It turns out the Herschel Space Observatory has a trick up its sleeve. The telescope, a European Space Agency mission with important NASA contributions, has proven to be excellent at finding magnified, faraway galaxies. The Herschel infrared space observatory has discovered that ultraviolet starlight is the key ingredient for making water in space. It is the only explanation for why a dying star is surrounded by a gigantic cloud of hot water vapor. Herschel is a European Space Agency mission with important participation from NASA. The first scientific results obtained with Herschel are appearing, this week, in a special issue of the journal Astronomy and Astrophysics. Based on data collected during the first few months of operations with this ESA observatory, the 152 new publications tackle a multitude of different astrophysical subjects, ranging from nearby Solar System bodies through newly-forming stars in our Galaxy, all the way to very distant galaxies. Amazing new data captured by ESA’s Herschel Space Observatory – carrying the largest mirror ever launched into space - have just been publicly released, allowing the World’s astronomers to share in the Herschel SPIRE instrument’s observations of distant galaxies. Astronomers using the European Space Agency's Herschel telescope have discovered that the brightest galaxies tend to be in the busiest parts of the Universe. This crucial piece of information will enable theorists to fix up their theories of galaxy formation. A year ago today the Herschel and Planck satellite pair lifted off on board an Ariane 5 from Europe’s Spaceport in French Guiana. Now, both spacecraft are busy supplying data to waiting scientists on Earth. The Herschel Space Observatory has made an unexpected discovery: a gaping hole in the clouds surrounding a batch of young stars. The hole has provided astronomers with a surprising glimpse into the end of the star-forming process. The first scientific results from ESA's Herschel infrared space observatory are revealing previously hidden details of star formation. New images show thousands of distant galaxies furiously building stars and beautiful star-forming clouds draped across the Milky Way. The Herschel Space Observatory has uncovered a cosmic garden of budding stars, each expected to grow to 10 times the mass of our sun. The Herschel Space Observatory has revealed the chemical fingerprints of potential life-enabling organic molecules in the Orion Nebula, a nearby stellar nursery in our Milky Way galaxy. ESA’s Herschel observatory is back to full operation following the reactivation of its HIFI instrument. HIFI, having been offline for 160 days while engineers investigated an unexpected problem in the electronic system, is now perfectly placed to resume its study of forming stars and planets. A University of British Columbia astronomer has produced the most detailed images of deep space from 12 billion years ago, using data from the European Space Agency's Herschel Space Observatory. Herschel has peered inside an unseen stellar nursery and revealed surprising amounts of activity. Some 700 newly-forming stars are estimated to be crowded into filaments of dust stretching through the image. Herschel spectroscopy takes center stage today as new spectra, obtained with the SPIRE, PACS and HIFI instruments during the performance verification phase, are released by ESA and the instrument teams. A new image from the Herschel Space Observatory shows off the observatory's talents for seeing multiple wavelengths of light. The infrared observatory, a European Space Agency mission with important participation from NASA, can use two science instruments simultaneously to see five different "colors" of infrared, which is light that we can't see with our eyes. On August 3, 2009, Herschel's Heterodyne Instrument for the Far Infrared, or HIFI, was switched off temporarily after an anomaly was registered. 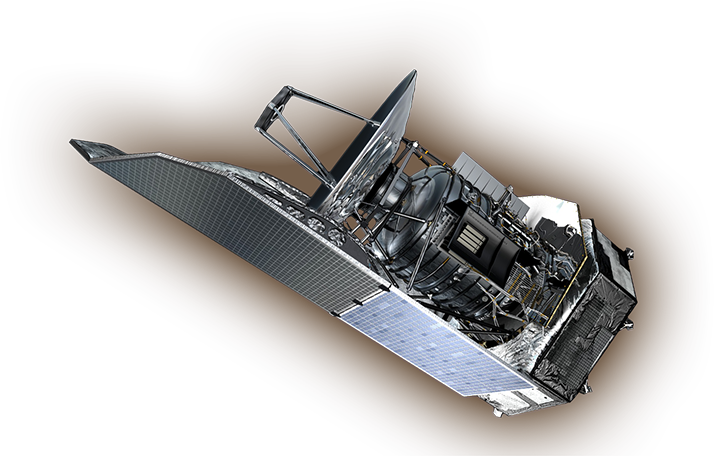 Engineers and scientists are continuing to characterize the performance of the Herschel Space Observatory, following its successful launch on May 14, 2009. All three of Herschel's instruments have now opened their eyes and collected their first astronomy data. The Herschel Space Observatory has snapped its first picture since blasting into space on May 14, 2009. The mission, led by the European Space Agency with important participation from NASA, will use infrared light to explore our cosmic roots, addressing questions of how stars and galaxies are born.